There is a current wave of student occupations across London. KCL, LSE, UAL, Goldsmiths have all been targeted, and I’m sure more are brewing. 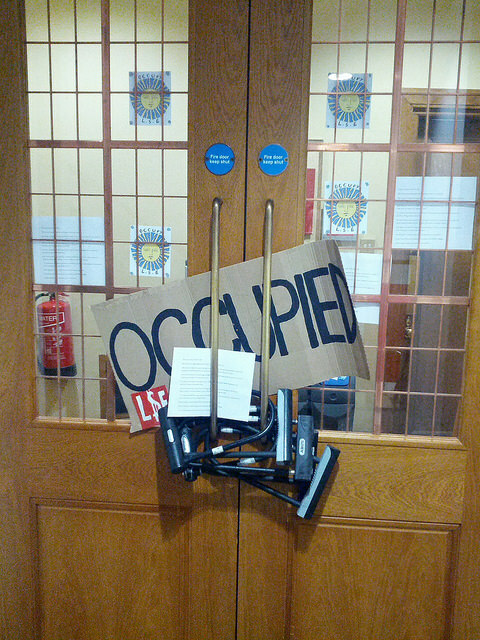 The LSE occupation was the first (that I noticed anyway) and they are calling for a “Free University of London” and aiming to create an “open, creative and liberated space, where all are free to participate in the imagining of a new directly democratic, non-hierarchical and universally accessible education”. There has been plenty of coverage of these occupations in the relevant media outlets, not least UAL’s rather terse response in particular. Whatever the politics of these occupations and your views on the provisioning of higher education in this country (I happen to agree with their position), what I think is equally as important about these ‘events’ more broadly is that it is students as a cohort that are leading these protests. Categories: Activism, Human Geography, Occupy | Tags: activism, occupation, protests, Students | Permalink.